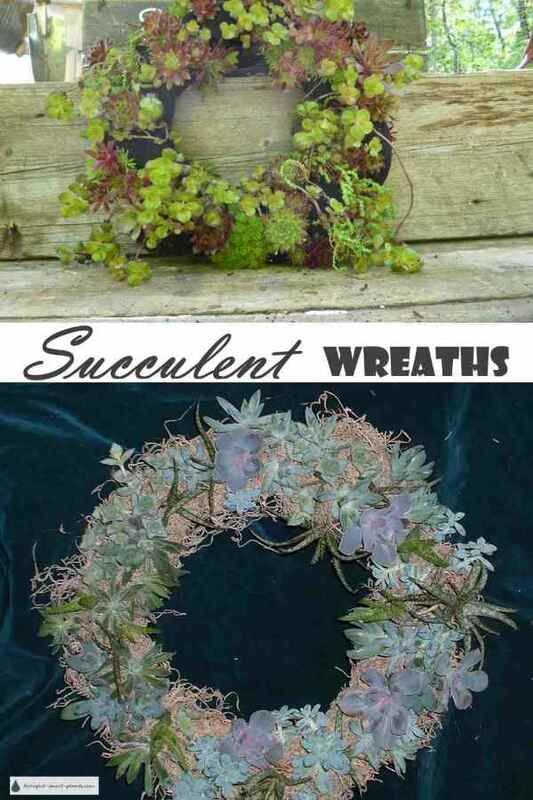 Growing succulent wreaths for centerpieces or for your door is an easy way to have spectacular results. 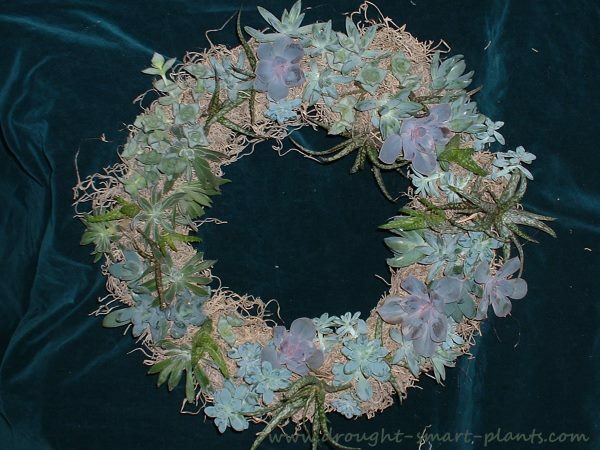 You can buy a succulent wreath, for a price, but why not build your own? Each succulent living wreath is unique, and changes over time as the plants get more established. Use cuttings from your succulent collection - this is one fun way to use all your prunings. You can also buy cuttings of succulent plants online or beg from friends with a collection. For a medium sized succulent wreath, you'll need about 100 cuttings or small plants, so don't waste any of the bits you cut off when pruning your collection - plug them into little pots or a flat so you'll have lots of choice when you go to make your wreath. Many succulents root so easily that you can just lay them in place, and in a few weeks they've rooted into the soil or medium. Succulent mosaics, succulent walls or facades and topiaries are other good projects for your excess cuttings. Some of the best succulent wreaths have many textures and colours from a vast array of succulent plants, from Echeveria to Aloe and succulent plants of all descriptions. Choose those varieties and species that stay small as these will give you a wreath that will last much longer. Some of the hardy succulents make great outdoor wreaths too, such as Sedum and Sempervivum , in which case, you will only be able to display it until the weather turns frigid. Keep it for the winter months covered by dry leaves for protection as the plants won't be as cold hardy as they normally are in the ground. Other plants that you can use are Tillandsia, the air plant, which I would never have dreamed could look so fabulous. Tender succulents combine so well in a wreath, many of them are drought tolerant and low growing - a perfect combination. Note: before beginning, if you can take your cuttings and let them callous for a few hours to overnight you'll prevent them rotting before they root. To start your wreath, you'll need a wire wreath base which you can buy at most craft stores or online, some wire, and spagnum or sheet moss. Coir fiber is another good alternative, and getting easier to find. Soak the moss for a bit to get it moist all the way through, then pack it onto the wire base. Wind the wire around to hold it in place. Then you can stick your cuttings right into the spagnum moss, and if you have small plants, take the soil off them and carefully insert the rooted stem into the moss. They'll quickly make new roots to make up for those that get damaged. Use a pencil or other stick to make a hole in the moss for each cutting. Keep your wreath flat until the cuttings root, which can take several weeks depending on the type of plants and the climate, and then you can hang it on the wall or door to display it. To water, simply soak the whole wreath in a shallow dish or tub for a few minutes. You can add water soluble fertilizer to the water at half the recommended strength. 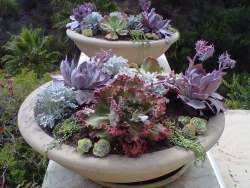 It's not advised to over-water it or spray it with water as this can cause the succulents to rot. Turn your succulent wreath occasionally so the plants don't stretch too much in one direction, and prune them as needed to shape; use the pieces to make another wreath - I'll bet you won't be able to resist growing succulent wreaths! Have you made a spectacular Succulent Wreath? If you are artsy and creative, share it! With succulents in all the headlines you need to know how to use these incredible plants in all kinds of ways - Succulent Wreaths are so easy and beautiful.